Click here for infographic, "Scoliosis by The Numbers"
Because we walk on 2 feet, the human nervous system constantly works through reflexes and postural control to keep our spine in a straight line from side to side and front to back. Occasionally, a lateral (sideways) curvature develops. If the curvature is larger than 10 degrees, it is called 'scoliosis'. Curves less than 10 degrees are often just postural changes. Scoliosis can also be accompanied by lordosis (abnormal curvature toward the front) or kyphosis (abnormal curvature toward the back). In most cases, the vertebrae are also rotated. In more than 80% of cases, the cause of scoliotic curvatures is unknown; we call this condition idiopathic scoliosis. In other cases, trauma, neurological disease, tumors, and the like are responsible. Functional scoliosis is often caused by some postural problem, muscle spasm, or leg-length inequality, which can often be addressed. Structural scoliosis does not reduce with postural maneuvers. Either type can be idiopathic or have an underlying cause.Scoliosis is an abnormal sideways curvature of the spine that affects 2 to 4% of the population. This condition usually goes unnoticed, especially as it rarely causes problems in the early years. It can begin in infancy, childhood or adulthood, but is usually seen in adolescents. Click here for video, "What is Scoliosis?" Although this condition can occur in both males and females, it is about ten times more common in females. The scoliosis curvature is often shaped like the letter S or C, and the spine is sometimes also twisted. Parents may see an uneven waist or shoulders, particularly prominent shoulder blades or shoulders, elevated hips or leaning to one side. The rib cage can also become more prominent on one side, this becomes more evident if you ask the person to bend forward whilst observing them from behind. Click here for video "Scoliosis Pain and Chiropractic"
These factors may cause the spine to become curved and may be reversed. There are two general types of scoliosis, a structural scoliosis and a functional scoliosis. The structural type is due to an improperly formed bone. The bone may have been malformed by a birth defect, or may have developed from a fractured bone which healed with an abnormal shape. Since gravity is always pulling down on the body, the structure which is resting on top of the malformed bone may not sit level. This is the beginning of a tilt to the spine. About 80 percent of scoliosis cases are idiopathic, meaning the cause is unknown. There is no research evidence that chiropractic treatment can "cure" idiopathic scoliosis. But our treatment can help give relief for some of the pain caused by idiopathic scoliosis. That will help your child to stay active which is important for their general health and well-being. Scoliosis can run in families. A child who has a parent, brother, or sister with idiopathic scoliosis should have regular check-ups.Adults who had scoliosis as children are more likely to have chronic back pain than people in the general population. 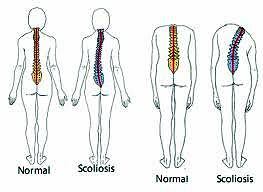 Therefore, the most important thing is to detect the scoliosis in the first place, diagnose the cause of the scoliosis and then treat it appropriately. Chiropractic care maintains the mobility of the joints of the spine and allows the spine to develop normally. Proper treatment,especially if commenced earlier than later, can prevent progression of the curve and may help reduce it. With scoliosis particularly, an ounce of prevention is worth a pound of cure. NEUROLOGICAL EFFECTS: Due to the compensatory head tilt, the orbits of the eyes in a scoliotic patient are unleveled. This unleveling in turn affects the balance mechanism, proprioception and oculo-vestibular function of the patient. The spinal cord is subjected to lateral deviation and the dorsal nerves are stretched in some areas and atrophied in other areas. Research shows that a 10% stretch applied to a nerve will affect the nerves ability to transmit impulses. OSSEOUS EFFECTS: The most obvious aspect of this disease is the impact upon the spine itself. The vertebral bodies of the spine are subjected to abnormal pressures due to the distortion, which is developing. This may result in asymmetry in the individual vertebra. Interestingly, the vertebral bodies of the scoliotic patient are 50% taller and 15% wider than average. BIOMECHANICAL EFFECTS: Scoliotic patients have hyperflexibility in the ligaments which hold the spine and this hyperflexibility contributes to the three dimensional distortion which occurs. The spine becomes laterally curved as well as rotated. This distortion negatively impacts the discs between the vertebra and causes fibrous changes to the ligaments. MUSCULAR EFFECTS: The muscles that attach to the spine directly are greatly affected due to the curvature. As the origins and insertions of the muscles are contorted due to changes in the force vectors caused by the curvature, the muscles can begin to work against the patient. Ultimately, these compromised muscles add to the problem. With time the muscles also begin to develop scar tissue. BIOCHEMICAL EFFECTS: Patients with Idiopathic Scoliosis also have nutritional challenges, which must be addressed. There is reason to believe that the scoliotic patient has digestion and absorption problems. They tend to have compromised immune systems leaving them subject to flu and viruses. These patients harbor some unusual and often extreme mineral imbalances as demonstrated by hair mineral analysis. These nutritional imbalances contribute to the hormonal imbalances which ultimately contribute to the ligamentous laxity which accelerates the condition. Does the child hold their head tipped to one side? With both arms hanging down to their side, is there more room between their body and an arm on one side or the other? Have the child bend over at the waist (as to touch their toes). Does one side of the spine appear more prominent than the other? Is there a hump on one side between the shoulders or on the lower back? If any of the above tests appear positive, then have your child checked by a chiropractor for scoliosis. Chiropractors use medical and family history, physical and neurological examination when checking a person for scoliosis. An X-ray will help to diagnose the scoliosis and lets the chiropractor measure the curve and see its location, shape and pattern. An early X-ray is useful to check for any subsequent increase in curvature later on. Despite years of research doctors don't know what causes the most common type of scoliosis. When a cause can't be identified, the scoliosis is called idiopathic scoliosis. Most cases develop in children between the ages of 9 and 14 during the growth spurt of puberty. It affects more girls than boys with 80 percent of adolescent cases affecting girls. As the curvature gets worse, the spine tends to rotate. This can affect the ribs, which become prominent on one side. In severe cases of early onset upper back scoliosis, the rotated ribs may limit the amount of air getting to the lungs and putting strain on the heart. This increases the risk of heart failure. This is why early diagnosis is important - appropriate treatment can prevent serious complications. Chiropractic spinal manipulation, therapeutic exercise and electrical muscle stimulation have also been advocated in the treatment of scoliosis. None of these therapies alone has been shown to consistently reduce scoliosis or to make the curvatures worse. For patients with back pain along with the scoliosis, manipulation and exercise may be of help. Call Advanced Healthcare today at (416) 633-3000 and have Dr. Pisarek evaluate you or your child to determine if spinal scoliosis is demonstrated, and recommend appropriate treatment options. Clinically Oriented Anatomy, 2nd Edition, Kieth L. Moore, Ph.D., F.I.A.C., Williams & Wilkens, 1985. Pgs 568-569. Textbook of Clinical Chiropractic: A Specific Biomechanical Approach., Gregory Plaugher, editor. Williams and Wilkens 1993, Pgs 266-278. Fundamentals of Orthopedics, 3rd Edition. John J. Gartland, M.D. , W.B. Saunders Company 1979. Pgs.339-343. Rothman, R., M.D., Simone, M.D., The Spine, 3rd edition W.B. Saunders Company, 1992. Bradford, D., M.D., Lonstein, M.D., Textbook of Scoliosis and Other Spinal Deformities, 3rd edition, W.B. Saunders Company, 1994. Kein, H., The Adolescent Spine, 2nd edition, Springer-Verlag, 1982. Cailliet, Rene, M.D., Scoliosis: Diagnosis and Management, F.A. Davis, 1975. Dingle, R.V., (ed. ), The CIBA Collection of Medical Illustrations; Vol. 8, Musculoskeletal System; Part II Developments/Disorder, Tumors, Rheumatic Disease, and Replacement, Summit, NJ, CIBA-Geig Corp:31-36, 1990. Sallahian, C., Reduction of a Scoliosis in an Adult Male Utilizing Specific Chiropractic Spinal Manipulation: A Case Report, Journal of Chiropractic Research and Clinical Investigation, Vol. 7, No. 2, July, 1991.